Tsukiko had the most liked content! Hmmm... I really don't know. I probably continue drifting in and out. Past three days I've reread the original DCWIRL thread. It was so nice to participate in even though we kept getting confused with each other's additions. And damn, I've had so many typos and grammar errors in my parts. Balthazar! It has indeed. How much of the old crowd still frequents this place? Status update. The description of this topic has been edited and the link changed into ArchiveOfOurOwn-link. More One-shots posted and Sequel gotten it's second chapter which includes events from movie 7: Crossroads at the Ancient Capital. Also, Leap to Relatively Unknown is now up to 29 chapters. Well, it's been not quite ten years since I joined DCW... I'm studying and hopefully graduating soon. Yo, I'm visiting again. OMM: Damn it has been a long time. I ate four mandarines and now my stomach is hurting. Hello again. It's been a while since this topic has been used but when I was reading wiki, I noticed this one thing and thought, why not to put it out here. So, I was reading the summaries of the movies and noticed that with the older ones the plot part and the final explanation are really difficult to read. Simply because it's all in one piece and just a wall of text. If I were to compare movie 7 to movie 17, it's easy to say which one is clearer and easier to read in general. Alright, it's been quite the while. Dream or Not reached 72 chapters and I decided to complete it and continue in a sequel. Leap to Relatively Unknown in the other hand has now 21 chapters. I've updated the first post to reflect the progress too. Thank you who have read and suppored my fic this far. Well, there is When Pandora's Box is Opened by mangaluva. It has a huge mythology behind the Pandora gem but ultimately it brings all the characters together to end the Black Organization. It also has romance but it doesn't jump in the face. All in all it is very well written fic that takes in count all the plot twists that far. It's long but also completed. Then there is a continuation fic for movie 13: Raven Chaser. The name is Fallout by The Silversage. It's unfortunately incomplete and probably will stay like that but it's really good. 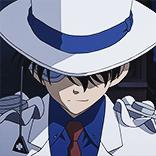 The chapters take turns with investigations on Conan/Kaito/Heiji+eventually Hakuba side and Satou/Takagi side. No romance. I sometimes read only Satou-Takagi chapters because Conan-Kaito fics are so common. Then there is quite humorous fic A Snowy Meeting by angelwingsonline. It combined Magic Kaito special episode 6 with Movie 15: Quater of Silence and the aftermath of Kaito getting mixed to the events of the movie... I'm not sure about the plot drive but it's quite nice too. Black Echo by DiscordianSamba had Heiji as BO member Paikaru. Like, he was a member even before Shinichi shrunk. This is really good fic with a lot of thought for Heiji's character. There is also another fic by the same author were Heiji loses his memories in an encounter with BO and is brainwashed into becoming Paikaru while the cast thinks him dead. That one takes place in future where Conan has taken the permanent antidote. Forgotten King by Rikkamaru. One-Shot about possible future. Leaves space for speculation. Peering Through the Cracks by Sgamer82. Yokomizo brothers investigating Haibara with the scant information they have. It returns to status-que but it's interesting to follow their thoughts and conclusions. Snapshot by Thefinalkey. I'm not sure about this one... But it has an OC as Shinichi's older sister. Unlike one would assume, it's quite well written and the story built. It's still in progress but follows quite interestingly the events of the Conan Arc(this far) from another point of view. The Tragedy of the Woman in Red Revised - Detective Conan Alternative by Serinox. As the title says: Red Woman case alternative, with Shinichi replacing Conan. It's good. Only warning though... There is a chapter where you might want to stop reading... read through it, you won't get disappointed. These all were taken from my favourite story list at FF.net thus the stories are found from there. I have a bunch of other fics on the list too mut I think these are the most suitable ones. I hope this list helps. Well, neither am I. Look at this! Last I was here was around three months ago! MK! you are still here! There are some more chapters for Leap to Relativly Unknown. I'm currently in progress of writing the next chapter to Dream or Not. No, it means that Ran is glad that she was mistaken when she assumedly saw Shinichi in... Shinjuku chapters previously. Ran has not seen Kaitou Kid's face. The plot point when she thought Shinichi to be Kid was only in Movie 14 which was years later from this scene. Considering that Kaitou Kid is just a visiting character occasionally it wouldn't make plot-vise any sense for Ran to think him as Shinichi constantly. Especially when Kid has never disguised as Shinichi in manga, it's only a movie thing.